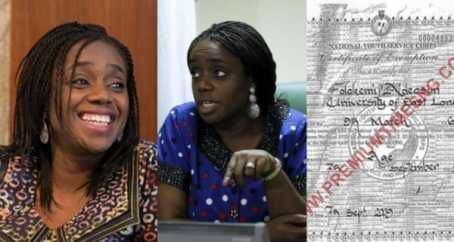 Kemi Adeosun whose resignation letter was accepted by President Buhari, 69 days after PREMIUM TIMES first published a detailed investigation of how she obtained the fake document and went on to secure plush employments with it, including as head of Nigeria’s finance ministry, left Nigeria for U.K where she was born and raised.“She has left Nigeria,” a source said. “She most likely is in the UK by now. ”According to Premium Times, her Nigerian line was dialed several times on Saturday night,and it rang through each time in the Europe internal phone ringing effect. Recall that we reported that Kemi Adeosun said she resigned, after she became aware that the NYSC discharge certificate she possesses, was not genuine. Read Kemi Adeosun’s resignation below:”I have, today, become privy to the findings of the investigation into the allegation made in an online medium that the Certificate of Exemption from National Youth Service Corp (NYSC) that I had presented was not genuine. This has come as a shock to me and I believe that in line with this administration’s focus on integrity, I must do the honourable thing and resign. Your Excellency, kindly permit me to outline some of the background to this matter. I was born and raised in the United Kingdom, indeed my parental family home remains in London. My visits to Nigeria up until the age of thirty-four (34) were holidays, with visas obtained in my UK passport. I obtained my first Nigerian passport at the age of thirty-four (34) and when I relocated there was debate as to whether NYSC Law applied to me. Upon enquiry as to my status relating to NYSC, I was informed that due to my residency history and having exceeded the age of thirty (30), I was exempted from the requirement to serve. Until recent events, that remained my understanding. I then received the certificate in question. Having never worked in NYSC, visited the premises, been privy to nor familiar with their operations, I had no reason to suspect that the certificate was anything but genuine. Indeed, I presented that certificate at the 2011 Ogun State House of Assembly and in 2015 for Directorate of State Services (DSS) Clearance as well as to the National Assembly for screening. Be that as it may, as someone totally committed to a culture of probity and accountability I have decided to resign with effect from Friday, 14th September, 2018.